Three Hoover High School teachers, one AmeriCorps volunteer and Principal Doug Wheeler sat covered in plastic, bracing for the Cool Whip facial to come. They were center court in the gym at the last assembly of the year. 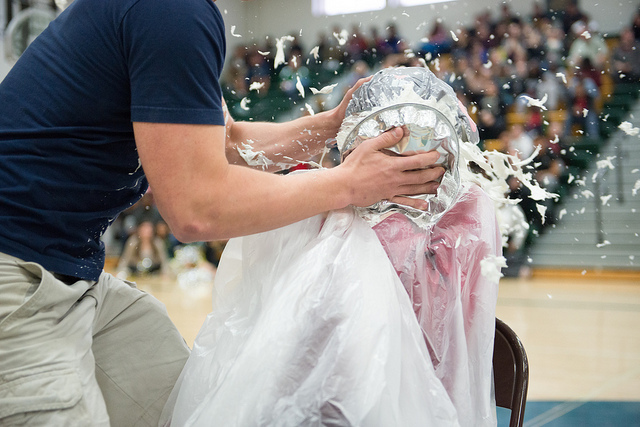 The entire student body was in the bleachers — except for the students lined up on the gym floor with whip cream-covered pie tins. Five lucky students, chosen by the intended victims, took turns smashing the confections into faces while the crowd cheered with delight. The group of targets were among 14 staff members who volunteered for a pie in the face. The final five were selected based on how much money was donated in their name to the student charity group, “Best Buddies.” The total take for the pie throwing was about $150. In turn, Best Buddies will use its resources for fundraisers like “Pennies for Patients,” which benefits the Leukemia and Lymphoma Society. This year, Best Buddies and most of Hoover High School adopted Wade Kramer, a 4-year-old battling b-cell acute-lymphoblastic leukemia. Together they raised $1700 in his honor. The pie-throwing was preceded by a student/teacher dance off. 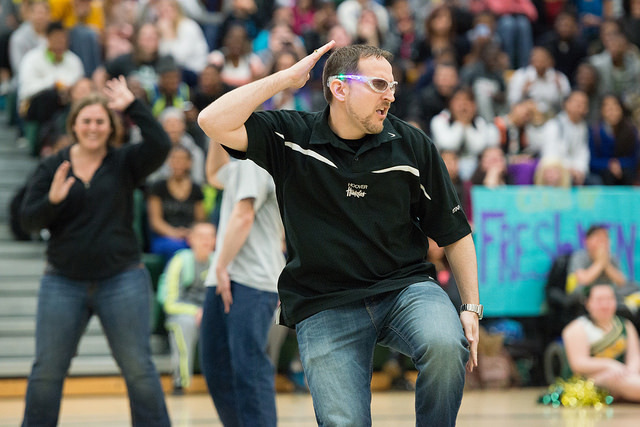 More than a dozen Hoover staff members busted a move to audio cuts from popular pop hits. They received a standing ovation. The Hoover assembly is the last one of the year. Wheeler said it was an opportunity for the kids to see the staff has a silly side, too. “It completes the picture and creates a bond between the teachers and students,” Wheeler said.